Most of you probably didn't know, but my goal in life is to one day be the Editor in Chief or the Creative Director of American Vogue magazine. Yes, its a very ambitious goal, but I never dream small, but that's a different story. 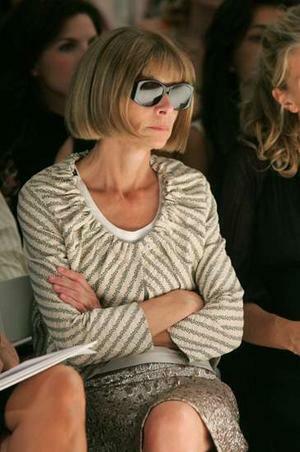 Anyway, most of you probably know that Anna Wintour is the current Editor in Chief of American Vogue, and she is by far the most powerful and most influential person in the industry today. Like the saying goes, "Her opinion is the only one that matters." But today I started to seriously give my personal style, and street-chic style a thought. And my conclusion? My conclusion is why is it that "her opinion is the only opinion that matters?" Fashion is about self expression, fashion is the freest form of art. It's a self identity. Why does Anna Wintour, Robbie Myers, and Carine Roitfeld get to tell me what is fashionable and what is trendy? 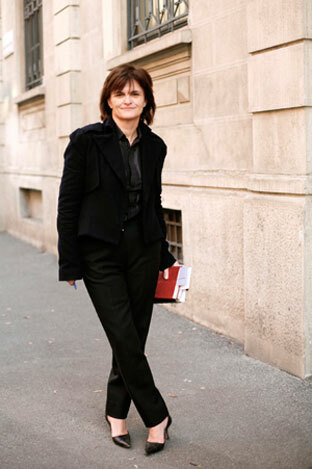 My three idols in the fashion industry are; Anna Wintour, Cathy Horyn, and Kelly Cutrone. I look up to them because they are three very powerful women who have all started at the bottom and are now at the top. For Gods sake Anna dropped out of high school and never went to college, and now look at her. Cathy grew up in a tiny hick town and now works for the New York Times. But my main rant for this blog is why do I have to spend hundreds of dollars on a Chanel sweater to be stylish. Fashion is all about being one's self. And that means if I find a label-less sweater from a thrift store that I can pull off, I should still be considered stylish. Stylish isn't about wearing the most expensive clothes, it's about being able to put items together, and actually pulling them off and looking good. I truly do not understand the meaning of this blog, maybe I will later, but I guess my main point is I think it's ridiculous that the main fashion publications of today tries and dictates what we wear. I think they need to stick on the message of personal interpretation of fashion, instead of sticking to the mainstream meaning. End of rant. I'll probably regret posting this tomorrow, but that's life I suppose. Just remember everyone, we are the future of fashion, and as the future we decide the future rules. And just because someone cannot afford to wear Oscar De La Renta, or Balmain, doesn't mean they cannot be considered stylish. That is all. Great blog, I'll follow you, :). I really like what you have to say. Really. It's true, you don't have $5,000 heels to look super chic, you can easily pull off an amazing look with $10 shoes. Fashion fades, but style does not. I admire your ambition because a lot of people hold their ambitions low to the ground so that they don't get discouraged when they don't get far. I too am trying to fling myself into the business. I dunno where or how but I'm doing the best I can to get the heck out of the North West (where no one really cares about fashion). So I guess best of luck to the both of us, eh? A place for Ideas, Inspiration and Fashion. Blog Catalog The images that are used, alongside illustration of articles, are given recognition from the source they came from. I do not own the copyright to the images publicized, they are used as a visual aid. © Fashion's Religion 2010-2011. All rights reserved.